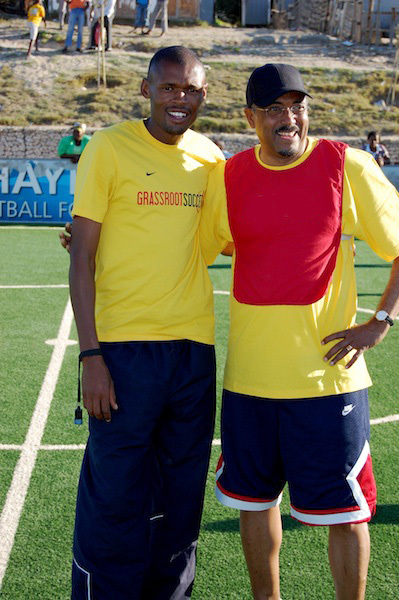 NORWICH, VT (November 2, 2011) – Grassroot Soccer announced the appointment of two new Directors to its Global Board: Michel Sidibé, Executive Director of the Joint United Nations Programme on HIV/AIDS (UNAIDS), and Susan Smith Ellis, former CEO of Product (RED). Grassroot Soccer is an international nonprofit founded in 2002 that uses the power of soccer to prevent new HIV infections and save lives among youth in Africa. Michel Sidibé is the Executive Director of UNAIDS and Under-Secretary-General of the United Nations. In this position, he is the global advocate for the AIDS response and supports countries’ efforts to reach universal access goals towards HIV prevention, treatment, care and support. A native of Mali, Mr. Sidibé has spent more than 25 years in public service, including 14 years at UNICEF in multiple African countries. Among his commendations, in 2010 he received the Emerging Leader Award from the UN Foundation and the United Nations Association of the USA in recognition of his leadership in advancing UN causes. Susan Smith Ellis helped the (RED) brand to increase contributions to The Global Fund from $18 million to $170 million. Susan Smith Ellis is the former CEO of Product (RED), the for-benefit brand that marries the private sector with the buying power of consumers to generate a sustainable flow of private sector funds to help eliminate AIDS in Africa. During her tenure, Product (RED)’s contributions to The Global Fund increased from $18 million to $170 million in just over three years. Prior to joining (RED), Ms. Smith Ellis spent more than 20 years as an executive in brand development and advertising, including the position of executive vice president of the Omnicom Group. She serves on the boards of Friends of the Global Fight Against AIDS , Malaria and Tuberculosis and also LOYAL 3.